My work uses new data to examine the causes of war and peace. Peace is vital for human welfare, but the cause is not well understood. The puzzle of peace has occupied scholars since Hobbes and the ancient philosophers before. One prominent piece of this puzzle has to do with the number of countries within a geographic area. While Alexander Hamilton argued that in a divided country ``the subdivisions into which they might be thrown would have frequent and violent contests with each other''. In recent years, USA Vice President Biden argued for a soft split in Iraq, which has since provoked much policy debate. Many people have thought and argued about how the number of countries in a geographic area affects political violence, but few provide any empirical answers. I provide an answer by bridging literatures from economics, political-science, and history, and by taking advantage of new advances in empirical geography. Reducing violence is a basic justification for the state and a central argument for the territorial unification of countries. Hobbes' logic that "during the time men live without a common power to keep them all in awe, they are in that condition which is called Warre'' is the foundation for many modern theories (Hirshleifer 1995, McGuire and Olson 1996, Alesina and Spolaore 2003, Konrad and Skaperdas 2012, Powell 2013). However, there are many nuances and complexities arising from both local and national actors, the interdependence of civil and interstate war for example. Such complexities lead other scholars to theorize about a more ambiguous relationship (Tullock 1974, Snidal 1985, Grossman 2002, Tullock 2006). There are many reasons why having more governments within an area could help reduce violence. Economists stress the benefits of competition in markets, and some of this logic might extend to politics. Applying the rent-seeking model of Tullock for instance, one could argue that concentrating an entire continents' political resources into a single capital induces military capture. I classify the the different arguments into 2 main categories: constraints and innovation. Constraints: The idea that more competition could cause the the government to provide better services (Tiebout 1956, Fleck and Hanssen 2013). Better policing or foreign policy, for example. One could also adapt the models of Grossman (1996 2002) to show that more symmetric contestants decreases predation. Innovation: The idea that better ideas emerge when there is a greater variance in policy ideas. A direct application of the discovery process from Hayek (1948) is that more political units encourages better ideas about peace and encourages the discovery of new arrangements and adaptation to circumstance. Montesquieu (1748) argues that "Should a popular insurrection happen in one of the confederate states, the others are able to quell it. Should abuses creep into one part, they are reformed by those that remain sound.'' This is an also an indirect route, where domestic policy innovation improves economic growth which reduces violence. Political innovation on factors like tax and regulatory policy could improve economic growth, what Bernholz and Vaubel 2005 call the "Hume-North hypothesis'', and this could raise the opportunity cost of violence. I exploit variation in the colonial borders of African countries, which I consider a natural experiment. I also integrate spatio-temporal data on violence from different types of actors. In general, war is a mess and so is the data. In general, there are no randomized controlled trials for country territories. 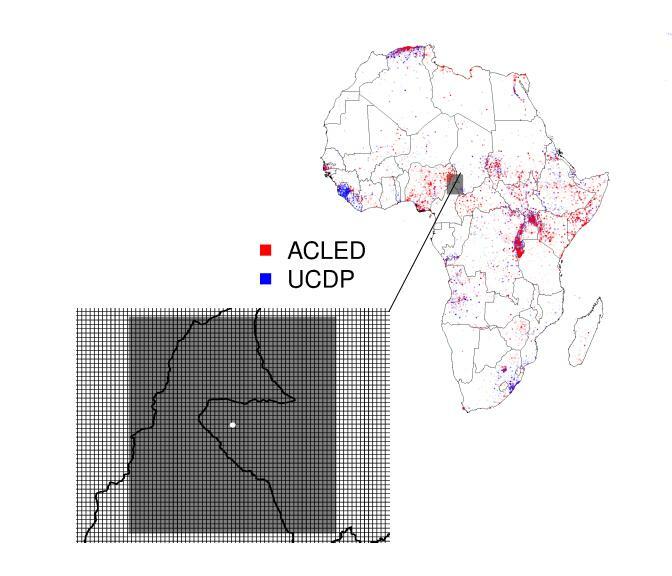 However, the African setting, and the data available, helps address the empirical problems such as data limitations, confounding factors, reverse causation, and many multiple actors. This, I believe, is my major contribution. I also contribute by creating a measure of geopolitical concentration that measures the size distribution of countries in a geographic area. This is a Herfindahl-Hirschman Index and I will explain this measure shortly. The figure shows my two main variables: violence and geo-political concentration. Fatalities over all years are plotted as points, with more deaths represented by darker colors. Geo-political concentration is calculated with a Herfindahl-Hirschman Index over the country shares of land within a window around each geo-cell. An area is completely geo-politically concentrated if HHI=1. Each cell has a geographic area/window and a land surface area for each country in that window, and an HHI value of the land surface areas in that window. Consider one specific example of the calculations math. For one geo-cell (the white dot), I construct a window around it (the grey area). Then I calculate the surface areas of the countries in that area, which are Nigeria (.1), Cameroon (.48), and Chad (.42) in order from left to right. Then I calculate the HHI value of those shares, which is 0.4 in this instance. HHI is not a perfect measure, and I've created an opening to explore all sorts of measures of geographic concentration in a wide variety of settings. I find the relationship between geopolitical concentration and violence is non-linear: the reduction in violence is large when there are many countries, but then plateaus, and might eventually reverse. I stress that there are non-trivial costs to concentration, even in terms of violence. The aggregate effect is to reduce violence on average, but not always. When I look at different geographic scales, I find that the relationship in larger geographic windows looks more like a "reverse J''. This means that complete concentration over larger areas are worse for violence. I also disaggregate violence into categories based on the different types of actors. There is significant heterogeneity, with the share of ``government vs rebel-or-civilian'' violence increasing with concentration. This suggests that although geopolitical concentration discourages external conflict, complete concentration is a source of internal conflict. This empirical result supports the idea of Montesquieu, which is the title of this post. Jordan is a PhD student at Clemson University.